How do developing cells become cells of a particular type? Sui Huang, Gabriel Eichler, Yaneer Bar-Yam, and Don Ingber have found that a developing cell is guided toward its fate by the stability-seeking behavior of its entire network of genes and proteins. S. Huang, G. Eichler, Y. Bar-Yam and D. E. Ingber, Cell fates as high-dimensional attractor states of a complex gene regulatory network, Physical Review Letters 94, 128701, 2005. Benjamin de Bivort, Sui Huang, and Yaneer Bar-Yam have discovered the key collective behaviors of cells, paving the way to medical applications. Using measurements of genetic activity, they identified 12 major functional units of the cell and their influence on each other. B. de Bivort, S. Huang and Y. Bar-Yam, Dynamics of cellular level function and regulation derived from murine expression array data, PNAS 101, 17687-92, 2004. Justin Werfel and Yaneer Bar-Yam have proposed a new understanding of the evolutionary origins of altruism. The model examines the evolution of reproductive restraint through social communication and shows that selfish individuals introduced to an altruistic population end up being driven to extinction. J. K. Werfel and Y. Bar-Yam, The evolution of reproductive restraint through social communication, Proceedings of the National Academy of Sciences 101, 11019-11024, 2004. Erik Rauch, Hiroki Sayama, and Yaneer Bar-Yam examined evolution in a spatial model of a pathogen infecting hosts. They used genealogical tracing to examine the spatial and temporal dynamics of strains. After several generations, mutations lead to new strains whose properties have a large impact on their local host environment, impacting on the liklihood of survival of their offspring over many generations. E. M. Rauch, H. Sayama, and Y. Bar-Yam: Dynamics and genealogy of strains in spatially extended host-pathogen models, Journal of Theoretical Biology 221, 655-664, 2003. These studies introduce a model of spatially-distributed populations of organisms that mate and compete. Competition for local finite resources causes Turing instability in population distribution, possibly leading to the formation of isolated groups. This model also shows dynamically coarsening domains in genetic distribution. Hiroki Sayama, Marcus A.M. de Aguiar, Yaneer Bar-Yam, and Michel Baranger examined interplay of these two dynamics and showed that the domain coarsening process is strongly affected by the spatial separation between groups created by the Turing pattern formation process. The ratio between mating and competition ranges is found to be one of the main ways to determine the long-term evolution of genes in the population. 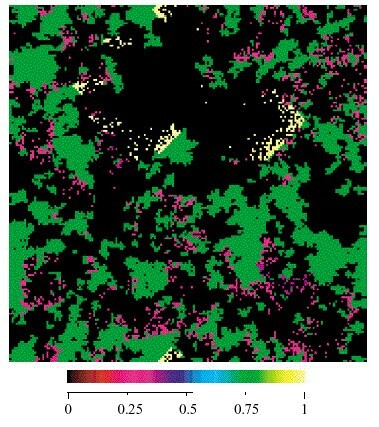 H. Sayama, M. A. M. de Aguiar, Y. Bar-Yam, and M. Baranger: Interplay between Turing pattern formation and domain coarsening in spatially extended population models, FORMA, SciPress, Tokyo, Japan, 2003 (in press). The gene-centered view of evolution assumes that one can assign fitness to each allele. In applying this view to genomic probabilities in reproduction, Hiroki Sayama and Yaneer Bar-Yam have shown it to be invalid when symmetry breaking and pattern formation occur within a population. These results are significant for genetic diversity and for saving endangered species. H. Sayama and Y. Bar-Yam: The gene centered view of evolution and symmetry breaking and pattern formation in spatially distributed evolutionary processes, Nonlinear Dynamics in the Life and Social Sciences, W. Sulis and I. Trofimova, eds., NATO Science Series A/320, 360-368, 2001, IOS Press.